Bing cherries are one of my favorite summer foods. Juicy, sweet, easy to eat out of hand...they are a perfect snack. Occasionally in my kitchen a few of them will find their way into a batch of scones...or a cake...or a tart.... But mostly, I don't cook with them—I just want to enjoy them raw. That said, one way I do enjoy Bing cherries in their cooked form is in a compote. I usually think of a Bing cherry compote as being something for dessert...to spoon over vanilla ice cream...or accompany a slice of pound cake. But not always. A few years ago I ran across a recipe in one of my favorite cookbooks for pork tenderloin with Bing cherries. The cherries in this recipe are the foundation of a reduction sauce that is really just a savory compote....and it is truly delicious with the pork. 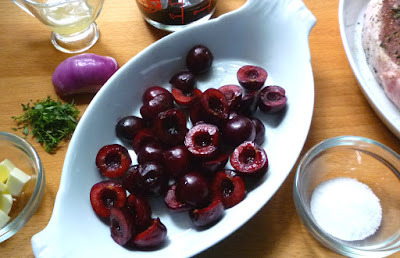 Best of all, if you are willing to pit a few cherries, it is a fast and easy center piece for a simple summer meal (just roast some potatoes...or make some rice or couscous...and blanch a green vegetable ... and you have dinner). I have made only one change to the original recipe. I use boneless pork loin chops instead of pork tenderloin. I'm not a huge fan of pork tenderloin. It tends to be a bit dry (because it is so very lean)...and its tapered shape makes it so that it is difficult to cook to a uniform doneness. Either the narrow portion will be overcooked and dry, or the fatter end will be too undercooked for most people's liking. Pork loin chops don't have any of these problems. While on the subject of doneness, I would like to make a case for cooking pork to a lower temperature than the traditionally recommended 145° to 160° F. The trichinae parasite which for many years was associated with pork has been virtually eradicated in the U.S. Even if you did have in your possession a piece of pork harboring this parasite, cooking the pork so that it reaches (and maintains for a few moments) a temperature in the range of 135° to 140° F will eradicate the parasite. (If you are interested in the technical details, there is a lot of information on this USDA site.). When I cook pork, I aim for an internal temperature between 130° and 135°. The temperature will continue to rise as the meat rests, stopping somewhere between 135° and 140°. Cooking to this lower temperature range will result in a nice juicy piece of meat. Pork with a final internal temperature much over 140° can be pretty dry. Finally, I want to draw attention to the section of the recipe concerning pan size. It's very important that the pan be large enough to hold all of the halved cherries in a single layer. If the cherries are piled on top of one another (in a smaller pan), they will overcook and fall apart while the port and vinegar are reducing. While I'm sure this would taste fine, it wouldn't be nearly as beautiful on the plate. It is much better to use two pans than try to crowd everything into one. The original recipe for this dish is large, and I should admit that in practice, I almost never make the full recipe. At home I am only feeding two...and neither of us are very big meat eaters. We find that one 8 oz. pork chop is sufficient for us...and as long as I prepare a one third recipe of the sauce to go with our one chop (sliced and divided between two plates), we are more than satisfied. I mention this for a couple of reasons: First, to show that the recipe is quite flexible...that it can be easily altered to suit your family's needs....and secondly, to point out that all the pictures for this post were taken with these altered quantities (i.e. 1/6th recipe of pork...and 1/3rd recipe of the sauce). If you have never had Bing cherries—or any of the other dark, sweet varieties that fill the markets during cherry season—in a savory preparation, you should definitely give this recipe a try. I think that you will find this to be a dish that you will want to revisit each summer... at least once or twice. The day before you plan to serve the pork, place the pork in a non-reactive baking dish. Add the thyme, crushing it with your fingers to release its fragrance, along with the garlic. Rub the pork all over with the thyme and garlic. Season generously with salt (about 1/4 t. per chop...more or less, to taste) and freshly cracked black pepper. Cover loosely with plastic wrap and refrigerate overnight. Heat an ovenproof sauté pan (large enough to hold all of the halved cherries in a single layer*) over medium high heat. Add the oil and then the pork chops. Sear, turning once, until the chops are nicely browned. Transfer the pan to a preheated 400° oven and cook until the chops are done to your liking (an instant read thermometer will read between 130° and 135° for medium). Total cooking time (including the time on the stove and in the oven) will be about 7 to 10 minutes, depending on the thickness of the chops. Remove the pan from the oven and transfer the chops to a platter. While the chops rest, make the sauce: Place the pan over medium-high heat and add the shallots and thyme. Sauté until translucent and fragrant—a minute or so. Add the cherries. Cook, shaking the pan, until the cherries are beginning to sizzle. and cook until melted and beginning to caramelize. Increase the heat to high and add the balsamic vinegar and port. Bring to a boil and cook until thickened. (If the cherries are tender before the sauce is sufficiently reduced. Remove the pan from the heat and using a slotted spoon, transfer the cherries to a plate. Return the pan to the heat and continue to reduce the sauce.) If you are not yet ready to serve the pork, set the pan aside. * If you don’t have a sauté pan this large, use 2 smaller sauté pans. Consolidate all of the cherries and reduced sauce to one of the pans for the final warming with the butter and pork resting juices.